My arms tightened around her for I knew what that meant. Dear Daisy, our feathered child, although strong and healthy otherwise, would have to be put to sleep. I asked if I could hold her whilst this was done and it was over quite soon. She was there one minute and gone the next. The world had lost yet another great character and I had lost a great companion. ‘I see them like feathered children,’ said the vet sadly and I looked at him and smiled weakly. ‘Me too,’ I replied, fighting back the tears. Daisy had featured in many of my tales. 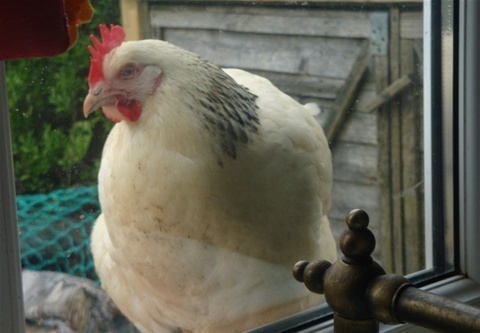 She was the large white hen that always sat on the kitchen windowsill as I wrote, waiting for her grapes and a cuddle. She was the one who knew everyone and everyone knew her. But Daisy was a non-conformist and loved nothing better than to hunt and wonder around the pond at our home for waifs and strays. However, this time of year there is a fence to protect the hundreds of young frogs, (about to land-walk for the first time) from the likes of Daisy. But no fence was going to stop her! And it didn’t! I can only guess that she broke her hip when flying over from one side to the other. Back at our home for waifs and strays, Featherpin greets us. Many of you already know Featherpin, she was the first hen we rescued, eight years ago. Knocking on deaths door at the battery farm, she has outlived all her original friends. It was wonderful to see her.